Midway through the International Summer University at ECLA, students and members of faculty and administration traveled together to the Saxon cultural capital of Dresden for a weekend of cultural site visits, exploration in the city and a boat ride down the Elbe river. ECLA’s art historian Alessandra Galizzi Kroegel led students through the famed Zwinger museum and the Gemäldegalerie, in addition to taking them on a walk through the historic core of the city. The Neues Grünes Gewölbe, a series of chambers filled with the treasures collected by Saxon royalty, was also visited on the trip. The weekend was capped by a two-hour ride in an authentic steamboat down the Elbe river to the medieval town of Meissen. This city, where European porcelain manufacturing techniques were first perfected, was not damaged in the second World War and provided the group with an especially interesting look into Saxon history. 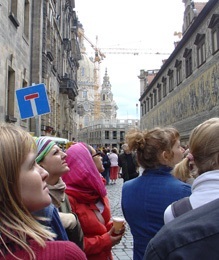 The trip to Dresden was part of the summer programme in 2004, but was extended to two nights this year to allow for more activities in the city.